Prepare delicious winter fruit desserts that will not take you much time and become favorites of your whole family. Pears with lemon are easily prepared. 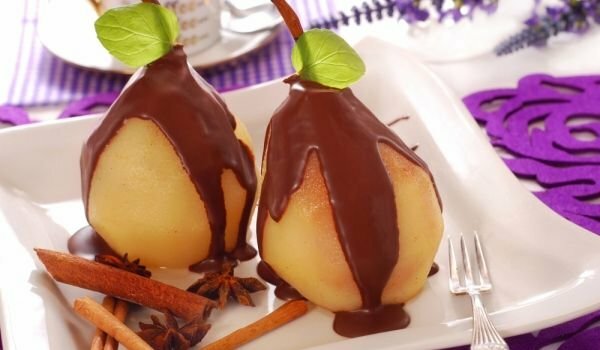 You need 2 lemons, 2 kilograms of hard ripe pears, 200 grams of sugar, 1 teaspoon of cinnamon, 1 orange, cut into circles – used for decoration. Squeeze the juice from one lemon, the other cut into thin slices along with the bark. Peel the pears and remove the core from the bottom. Do not remove the pear handles. Put the pears, lemon, lemon juice, sugar and cinnamon in a saucepan and add 1300 milliliters of water. Boil over strong heat, stir until the sugar dissolves and reduce the heat. Boil 15 minutes under the lid until the pears are softened. Remove with a grateful spoon. Put the water from the boiling of strong heat until boiling, and cook until it evaporates in half. Pour the pears with the hot syrup. Cool, leave for 4 hours in the refrigerator, occasionally shifting the pears. Serve with syrup and decorate with orange slices. It is easy to prepare the express fruit compote. You need 500 grams of dried fruit of choice, 200 milliliters of freshly squeezed orange juice, half a teaspoon of cinnamon, 6 carnations, 6 peppers. Pour the fruit in a saucepan, add the orange juice and spices, cook for ten minutes. You can serve with a handful of nuts added before serving. A fresh fruit salad is prepared quickly and easily by 200 grams of brown sugar powder, 250 milliliters of apple cider, 1 teaspoon cinnamon, 6 carnations, grated half-lemon peel, grated bark of half orange, 2 red grapefruit, 3 large oranges, 1 pineapple. Heat the sugar in 300 ml of water until it dissolves. Add the cider, spices and grated bark of orange and lemon. Cook for 15 minutes and allow to stand under cover for half an hour. Peel and cut the fruit, pour the sugar syrup into a saucepan and boil. Add the fruits and cook for 3 minutes. Serve the salad warm, you can decorate it with whipped cream. 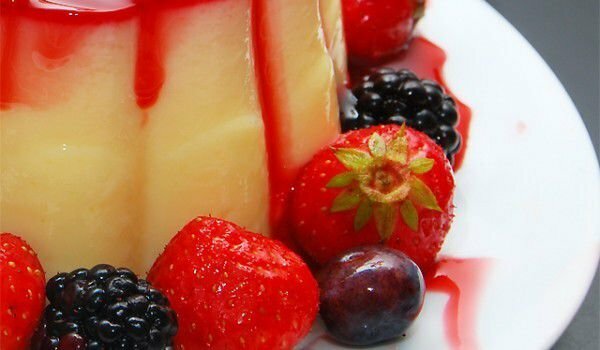 We offer you some tasty and tested gelatine desserts that have resisted the tastes of time. For the cooler days, make a pie with blueberries or an apricot cake. In the summer, lay the lemon cream. Required products: 150 g of sugar, 150 g of butter, 150 g of flour, 2 eggs, 6 tsp. gelatin, 2 apricot ingredients. Preparation: Dissolve gelatine in a glass of lukewarm water. Leave it in half an hour to swell. Then add another cup of water to the gelatine and put the mixture on the hot water bath to melt the gelatin. The mixture should not boil. Once the gelatin melts, withdraw the mixture from the hotplate and pour the juice from the two ingredients into it. Let them cool to start gelling. In the bowl, blow the butter in the foam, add the eggs and sugar, a little bit of flour until it’s over. Pour the marsh in a greased form and bake in a moderate oven. Once the marsh has cooled down, put the fruit out of the compost and pour the mixture into a gel. Then put it cool again to tighten. Our next suggestion is for a cream that is easy to prepare. It becomes light and delicious. For him, you have to scrape the bark of two lemons, add half a liter of water to it and put it on the hot plate. Let the mixture boil, then let boil for ten minutes. Then add the lemon juice to the mixture and 300 g of sugar. Mix and put 50 g of gelatin that you pre-mix in lukewarm water and then dissolve in a water bath. Stir well and pour a piece of jelly into cups, add jam on top of your choice, then cream again and sprinkle with almonds finely chopped.